Her is a very unquie tale about love and relationships, and is definitely worth the time to watch the tale. 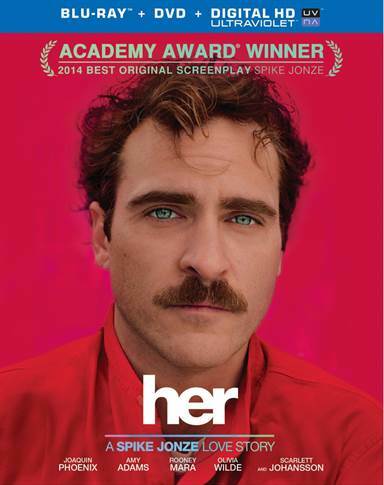 Her, starring Joaquin Phoenix, Amy Adams, Olivia Wilde, and the voice of Scarlett Johansson, is as unique as they come. The Oscar winner for Best Original Screenplay, set some time in the future, emphasizes humans' disconnection with each other in a computerized society. In the film, Theodore Twombly (Phoenix), recently separated from his wife, is employed as a copywriter who writes other people's personal letters for them. After purchasing a new operating system for his computer that has the ability to be personalized to its user and have conversations and learn, Twomby finds himself falling into an intimate relationship with Samantha, the operating system (Johansson). As Samantha has the ability to evolve and learn, so does their relationship as much as it can without an actual physical presence involved. Both Phoenix and Johansson performances are carefully crafted and brilliantly written in that their entire relationship is made up of conversations without actual physical interaction. Phoenix is great in that through his voice and body language do you see the depth of his feelings in the relationship. Johansson is able to use just her voice to express herself as the operating system who continues to learn and grow throughout the film. The Oscar, in my opinion, was well-deserved for originality and a well-written script. Her is reasonably conventional in the mechanical sense but its message is nuanced and complex (in an age where we usually get cautionary disaster tales about new technology) and its back-story / world building is rich and deep. Her is brave enough to show us its near future without feeling it has to tell us with voice-over narration or complicated explanation and it deserves to be watched carefully. The Blu-ray video is crisp and clean and brings out the detail. Her relies on a lot of close-ups of Theodore's face (as Johannson does not physically appear) and that comes through beautifully. The muted color pallet works especially well with Her's tone and the cut bring it out faithfully. The sound is DTS-HD Master Audio 5.1. The aural quality of Johansson's voice is carried through well: it dominates the sounds-cape. As Her is a drama, the rest of the voices are crisp through the front speaker with the other speakers handing ambient sound effects or music.. The Untitled Rick Howard Project (24:19): A short film by Lance Bangs, this simply showed bits of the film as it was filmed with no real narration, just outtakes of what was being filmed and who worked on it. Scenes include a view into the studio of Arcade Fire and scenes with Karen O, who helped in the making of the soundtrack as well. Her: Love in the Modern Age (15:10): This was another Lance Bang project that featured various people involved in the film discuss love and relationships in between showing clips of the film. How Do You Share Your Life With Somebody (3:56): This is a short segment showing more of what went into the making of the film featuring some behind the scenes clips. Her is a very unique tale about love and relationships, and is definitely worth the time to watch. Download Her from the iTunes Store in Digial HD. For more information about Her visit the FlickDirect Movie Database.